After the events of April 27, 2018 that lead to an unbelievable mark in the worlds history, President Rodrigo Roa Duterte admires and praises the once hated and villainized Kim Jong-Un, as he arrived from Singapore. "Naging idol ko tuloy siya, Kim Jong Un. For all of the time, he was pictured to be the bad boy of the community." In the past, North and South Korea has been in a 67 year war, called the Korean War. But it all ended after North Korean Leader Kim Jong-Un and South Korean President Moon Jae-in reconciled, agreeing to denuclearize the entire Korean Peninsula in a meeting that no one expected to end so well. It was unexpected since North Korea has been threatening its Southern counterpart, the United States of America and Japan with Nuclear War in the past few weeks. "But with one master stroke, he is now the hero of everybody. He appear to be amiable, jolly good fellow, and very accommodating." After the meeting, the North Korean Leader was even open to the option of visiting the capital of the South. Duterte on the other hand hopes that he stays this way for the betterment of all Asian countries. 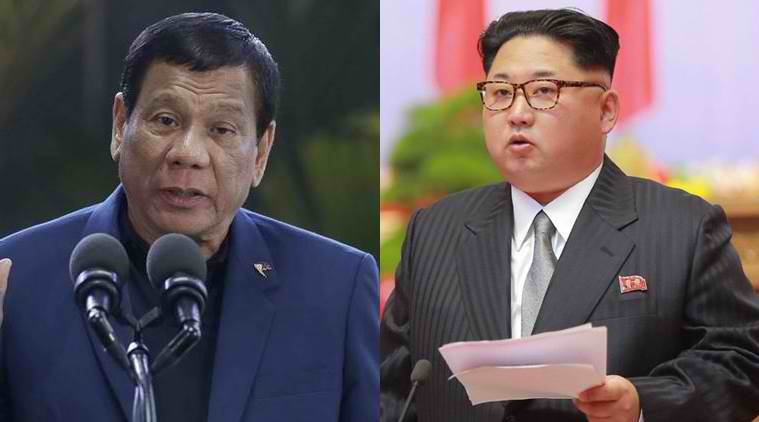 The Philippine President was known to lash out on the North Korean Leader in the past, calling him names like “tarantado” (shameless) and “buang” (crazy). Yet Duterte chose to become a better man by humbly admiring Kim Jong-Un and actually wanting to befriend him in hopes of making a more peaceful Asia. "Ituring na lang niya akong isang kaibigan because this will promote -- the impact is really, there is less stress now in the Korean Peninsula. And maybe, just maybe, we can avoid a war which nobody can win anyway," Duterte stated. On another note, Duterte also mentioned that Kim’s timing was impeccable. With the war that no one would benefit from, now avoided, Duterte and Kim Jong-Un are growing to show the western world that they’re the type of leaders that are negotiable. In the end every leader wants the peace and prosperity of their nation, so instead of befooling such men with power, it’d be better to treat these new-world Asian leaders with respect.